What do you mean kiran shukla? 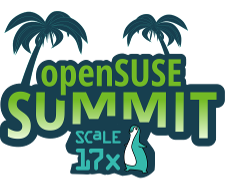 The SoCal Opensuse group with the help of Doug always hands out loads of wondrous freebies with no need to spin a wheel. We stopped with raffles long ago due to shipping costs and whatnot, they just lost their flare and became too much work for a volunteer group.